Finally! I am so happy to share my excitement with all of you – the devotional that I have been working on for so long is finally here. As you all know, I love reading and studying the Word of God. I’ve read through the Bible annually for many years, and one day, back in 2011, I started to think I needed to do more than just read through and as I prayed about it, God gave me a great idea: outline each day’s passage! So, in January 2012, I committed to outline each day’s reading. And, oh, by about January 5, I had a chat with God and suggested that maybe he was a bit too adventurous for me – outline every passage? That would be the entire Bible. In 365 pieces. Seriously? However, I pressed on. And on. And on. And, sure enough by November 30, 2012, I was amazed at the wonderful gift God had given me. I was almost through the entire Bible and I had a notebook full of great ideas. I only had a month left, and it seemed it was coming to an end too soon. Nope. Not me. No way. I cannot do that. That is so far outside the realm of what I am capable of doing. But as I prayed about it, I kept coming back to this idea of writing a devotional. 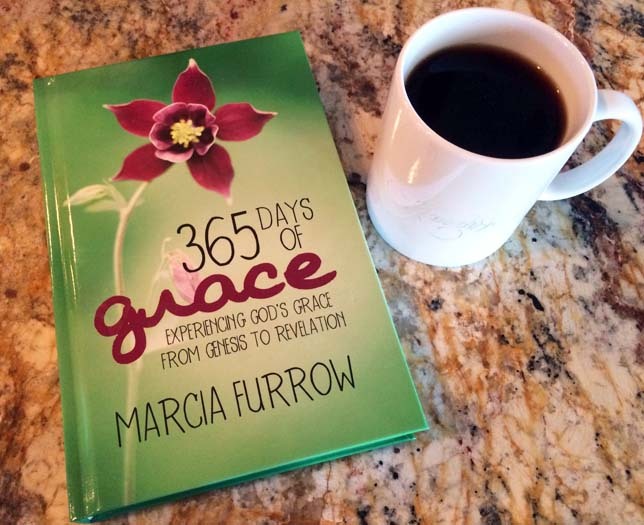 And the idea kept solidifying and clarifying… a daily devotional… highlighting the grace of God. Since it seemed this was my path for a while, I wrote a couple weeks worth of devotions and presented them at a writer’s conference in the summer of 2013 and they were enthusiastically received. Could this really be what I’m supposed to do? Yes. Then my dad passed away. My whole world turned upside down, and yet God had graciously given me this writing project that kept me grounded in his Word. Each day my focus was drawn to God, his Word, his truth, his grace. There were days when the last thing I wanted to do was go up to my office, open the Bible, my notebook, and my computer and write. I was afraid I would let God down. I was afraid I would have no words. I was afraid I would fail. I was afraid. However, I soon discovered the writing, as hard as it was, was just the beginning. With the help of some very dear friends, the manuscript was edited, re-written, edited, re-written, edited and re-written. Then it went to the publisher where it was edited again and again. As they say, good books are not written, they are re-written. And, truth be told, if given a chance, I would continue re-writing! I’ve always thought the best lectures I ever gave were the ones I gave driving home alone after class was over.Neither a writer nor a teacher is ever satisfied; there is always something more to say, or another way to say it. 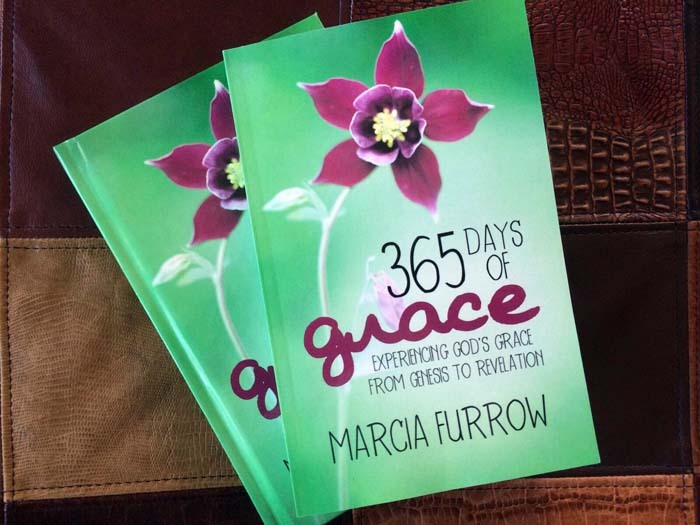 And now, here it is – 365 Days of Grace: Experiencing God’s Grace from Genesis to Revelation. In this book I’ve tried to point out where I see God being gracious to his children throughout the Bible. Sometimes he is gracious to allow very hard things, and sometimes he is gracious to allow very good things. Always God is gracious. His grace is intertwined with all his other attributes, so it is always on display. Each daily devotion in this book is less than three hundred words long, so you can read it in about 2-3 minutes. Each day has a brief summary of the passage, (what it says), a way to look at God’s grace today (what it means), and application questions (what it means for us). Finally, there is a little prayer to help you get started with your own prayer time. My goal for this book is to help you make your way through the Bible and encourage you as you read each day. I hope that you will take a look (click here) – and I hope that this will be a tool that fits your hand well, helping you dig deeper into the Word of God. Thank you for indulging my story. To God be the glory, great things he has done! Well done, Marcia. I’m well aware of the long and thoughtful work it takes to communicate clearly and influence positive results. The process is every bit as important as the product, and yet seeing it bound and beautiful is a sweet accomplishment. May God take your gift and multiply the blessings to many more. Thank you, Carol! I pray he is glorified in this gift. Thank you, for these sweet words and for all the times you talked me off the ledge 😉! From a young woman writing stories about breaking green beans with her grandmother on the front porch of an old house on Brush Creek, to an insightful daily devotional…quite a journey! Thanks for sharing your talents and God given inspiration with others. Congratulations Marcia.